This cup is very unusual amongst the other cups and is definitely worth trying either as a first cup or if you’ve tried other cups and they haven’t worked for you. 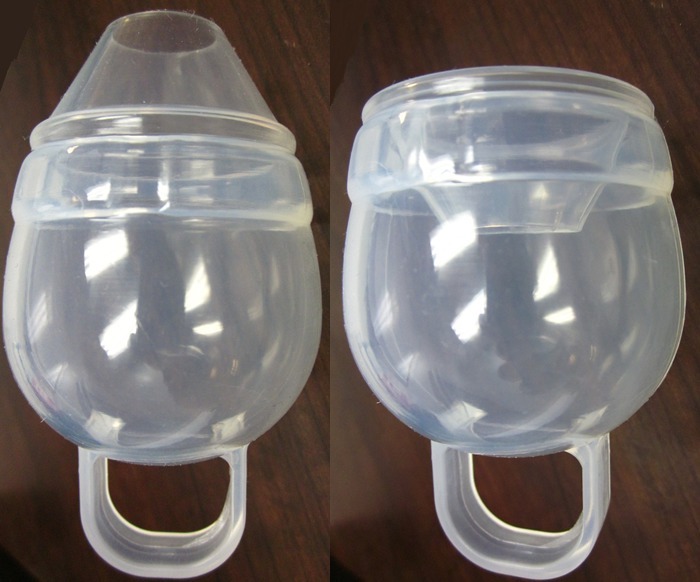 The FemmyCycle cup has turned the traditional menstrual cup design on its head. They've focused on making a menstrual cup that is spill proof. Instead of an open cup as the others are, this one has a narrow opening to a wider, bulb-shaped cup that means you can invert the cup without any spill. It's made of medical grade silicone that's clear so it's easy to clean. The stem is an innovative ring shape that's both comfortable and easy to use for removal. Unlike most menstrual cups, which come in a pre- and post- pregnancy version, the FemmyCycle comes in regular, low-cervix, and teen sizes. Both the regular and the low cervix hold 30ml of fluid which should be enough for 12 hours with a heavy period (your milage may vary). The cup is designed to not leak even though it does not open all the way, which may make it easier or more worry-free to insert.